Easy Chocolate Valentine's Day Lollipops for 2! Share With a Friend Heart-sicles! 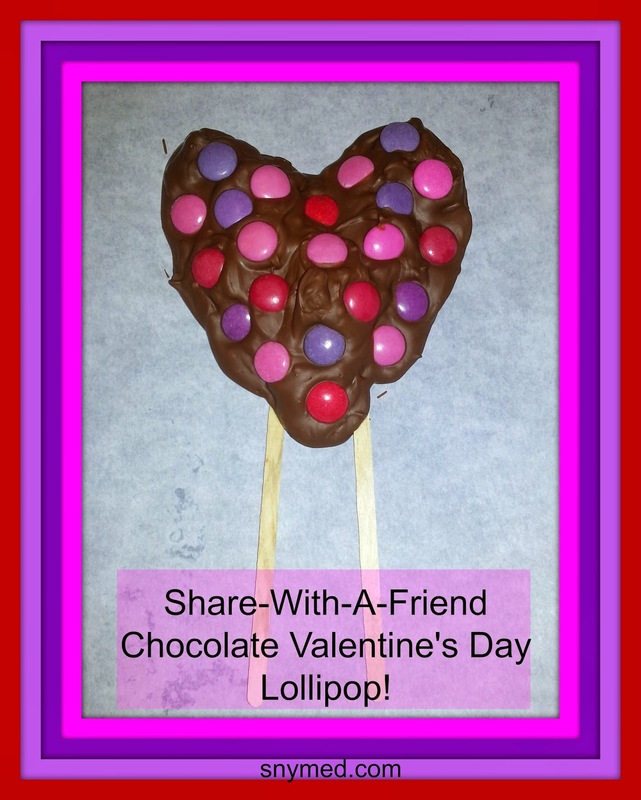 Share-With-A-Friend Chocolate Heart-sicle Lollipop For Valentine's Day! Last night I decided to make Chocolate Heart-sicles for Valentine's Day! With 5 young kids and a busy schedule, I knew it would have to be quick and easy with a fast clean up. So I went through the Halloween candy bag (which is still huge) and pulled out every plain milk chocolate chocolate bar and some Smarties. 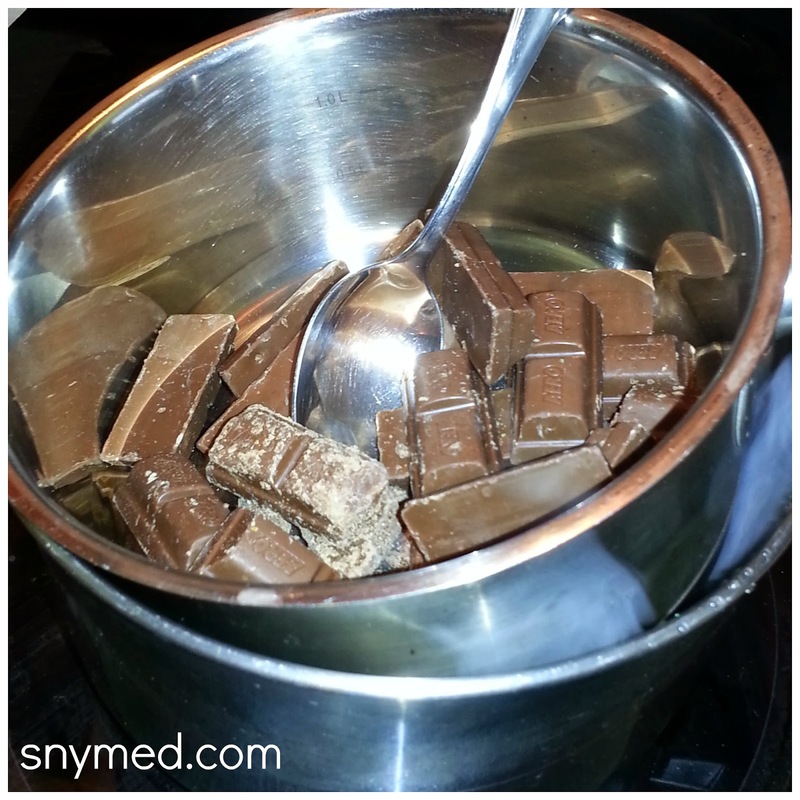 I happened to use some Aero and plain Hershey bars as the chocolate in my recipe. How to Make Chocolate Lollipops! You only need 3 items for this recipe: any chocolate and candies that you have on hand, and popsicle sticks. Parchment/wax paper is nice to have but not essential. I removed all the candy bar wrappers and consolidated the chocolate into a bowl. I did the same for the Smarties candies, and put them into a different bowl. This took minutes and was very easy to do. I don't own a double boiler, so I placed the unwrapped chocolates into a small saucepot and sat it in a larger pot of boiling water. In this manner the chocolate melted nicely and never burned. All I had to do was stir occasionally and ensure that there were no lumps in the chocolate. This was easy and took minutes! Next, I took a cookie sheet and lined it with a sheet of parchment paper to avoid having the chocolate stick to the cookie sheet. This is good to have, but not essential for the recipe. Then, I poured a 2.5" x 2.5" square of chocolate about 1/4" thick so I had a foundation on which to lie my popsicle sticks. Again, very easy. The measurement did not have to be perfect, I just wanted to be sure that the popsicle sticks were well-anchored. As I made the "Share-With-A-Friend" Chocolate Lollipops, I used 2 popsicle sticks placed 1.5" apart from each other in a parallel fashion. Popsicle sticks should be placed about 2/3rd deep into the chocolate heart, leaving the top 1/3rd of the heart-sicle empty. I first thought of the "chocolate lollipop for two" idea, as my kids love to share food with each other! It also helps to support the heavy weight of the heart-sicle. And it's a wonderful idea to promote friendship or love for Valentine's Day! 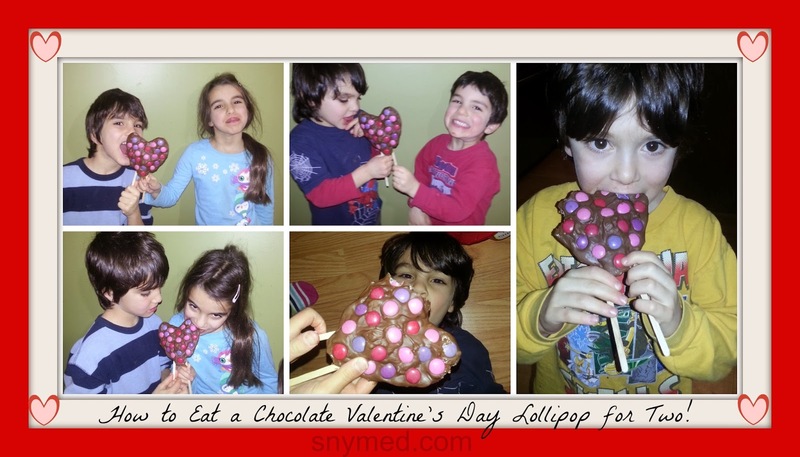 Easy Chocolate Heart-Sicles for Valentine's Day! Next, I ladled chocolate on top of the popsicle sticks and started to shape out a heart as best as I could from memory. It helped to use a teaspoon in order to properly shape out the heart. I made sure to cover the popsicles on top in 1/4" of chocolate. Once I was sure that the popsicle sticks were well covered, and I was happy with my heart, I started to decorate the heart-sicle with Smarties (you can use any candies that you have on hand). I pressed in a pattern of red, pink and purple Smarties for Valentine's Day colours. Or use your child's favourite colours! Lastly, I put the Chocolate Share-With-A-Friend heart-sicles into the refrigerator for 1 hour to harden. Time longer if still warm or soft. Below is the result of the Chocolate Share-With-A-Friend Heart-Sicles. They were a success and shared very nicely among the kids! Forget a Bicycle Built For Two! Try Sharing a Chocolate Heartsicle For 2! What's the verdict, would you share the Chocolate Heartsicle Lollipop? Who would you share it with if yes, and if no, how long would it take you to eat it? this looks awesome !and you know I have bags of these treats left over from the post halloween sales ! I might just have to try this ! Thanks Sarah, the kids loved it! It was also so easy! yum yum now i want chocolate! Angie, it's one of my temptations! It would not take long to eat it and it would be great for my kiddos! 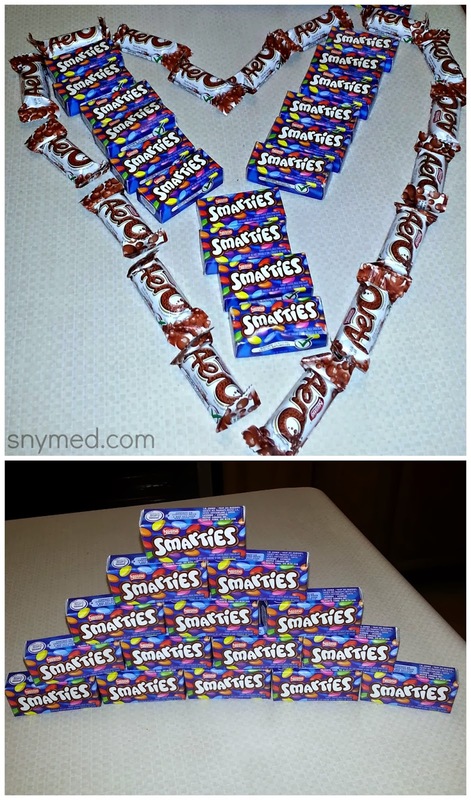 My son has food allergies so the fun size Areo bars and Smarties are the only ones I am guaranteed are peanut free. Great idea Jenna! Super Cute idea!! I just so happen to have some left over chocolate from Halloween! I have never thought of melting Areo! Oh the mint would be amazing melted. Oh your kiddies are so cute and I bet that was a hard run to share that yummy lolly. What a great idea Jenna!!! You are way too creative!! This is a great way to get rid of left over Halloween candy! Oh Yum. My boys would be on cloud 9 if I made this treat for them! Those cute and really easy to do. That is so cute!! I would totally make it and share it, if I didn't have something else planned. oh what a cute idea! Easy to make too! You had me at choc! Yummy! Can't wait to try this out! Look delicious! Awww these are so cute and perfect for Valentines Day! LOVE! looks easy to make and we are all chocolate freaks over here.. I am going to see if my daughter wants to make these.. I didn't realize how easy it was! I can do this with my new fondue fountain my husband got me for making cake pops for Christmas! Thank you! I would totally make one of these, but...I don't want to share! I am definitely craving chocolate now! Valentine's Day is so dangerous for me. That is so cute and looks so fun. I'll be my oldest would love making these with me. Ooohh these are cool! I have Popsicle sticks too, all I need is the chocolate and candies!! Great idea for the kids school parties! Yum! These are soo awesome ! I will have to take a look at kaelyns halloween candy so we can Make these too! these are great - can't wait to make them with my kids! This is such a great idea. I would do this any time of the year. It's absolutely adorable and I think it'll be great for birthday parties. Cute idea! I might have to try this in the shape of eggs for Easter! I too have quite a bit of candy left over. This is so fun for Valentine's Day!